NWA Quality Information System™ (NWA QIS) is the perfect choice to manage production, satisfy auditors, and meet customers’ quality-reporting requirements. And it can be implemented with limited staff time, budget, and IT resources. Whether you need to automate a single line or an entire plant, NWA QIS delivers a complete quality system from plant floor data collection to final reporting. 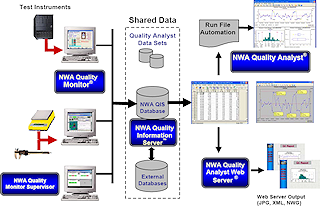 NWA Quality Analyst® is the core analytics engine and is the building block for the Quality System. NWA provides on-site Quick Start professional services to begin the screen designs, configuration, database setup, and network delivery of SPC charts and reports. Reports generated by SQL queries to the QIS database can be derived from templates or further customised by the company through MS SQL Reporting Services. Further integration of MS SQL Reporting Services with Adobe Acrobat Professional legitimizes electronic signature management for regulatory compliance. NWA’s Quality Information System can tie into external databases to retrieve customer specs, SOP documents, ERP standard costs, LIMS sample results, etc. using existing infrastructure. Quality Analyst Web Server® completes the reporting from the plant floor to the enterprise to institutionalise company-wide quality monitoring, best practices reporting, supply chain quality, and global process improvement initiatives. All NWA Suite components share data sets so that all process or product characteristics associated with a lot number-date-time-sample set can be uniquely identified. NWA’s data sets allow straightforward database table structures that are easy to set up, maintain, and expand as products are added. The NWA Suite uses the standard ODBC (Open Database Connectivity) technology to interchange data between components. The versatile data entry screens enable users to record measurements into the Quality Information System for any parameters currently relegated to clipboards. Each data entry workstation can be configured to match the data-logging tasks of that role/location. Network architecture can be LAN or WAN, with client interfaces or browser delivery of SPC and is fully compatible with Citrix servers. Existing MS SQL Server databases may be used. The NWA Quality Information System completes the SPC reporting from the local plant floor to the global enterprise. Shared data sets create an unambiguous foundation for regulatory, customer, supply chain or process improvement requirements so that the enterprise can be confident to make decisions based on the analysis. The design and administration of the quality database is greatly reduced to pre-defined tables so changes are manageable with less expertise. Using database standards means that any ODBC-compliant database can share information, giving more openness than closed databases. An “intelligent” quality system assists operators and technicians to reduce the burden of a paper system that cannot be as effective in processing automated measurements, calculations, off-spec alerting, SOP guidance, visualisation of SPC, and off-line analytics. The NWA Quality Information System can be a combination of centralised or local servers and multi-plant clients. Global sharing of quality information for best practices is readily achievable. Institutionalises company-wide quality monitoring, best practices reporting, supply chain quality, and global process improvement initiatives.